Read any news website, open any newspaper, or tune into any radio station and migration will soon make an appearance. Without journalists speaking to migrants and challenging official accounts, few people could keep track of the latest developments in the story of human mobility. 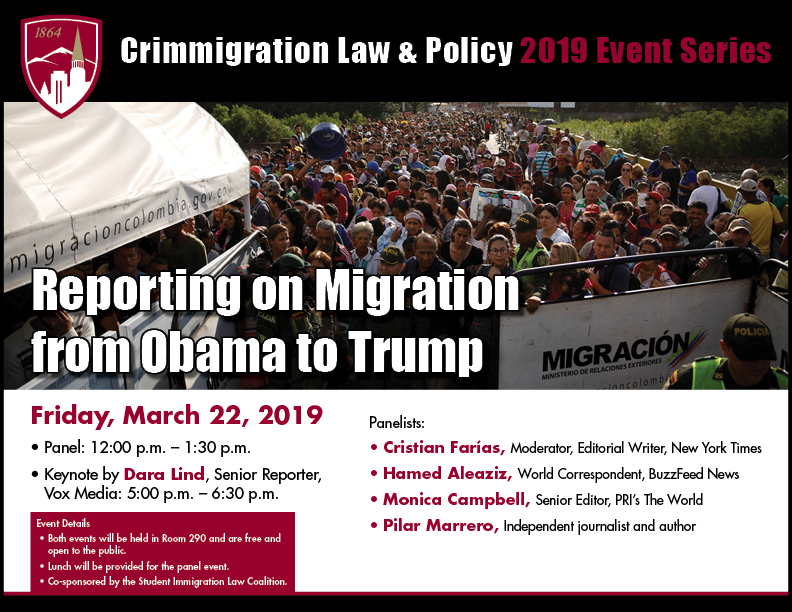 Reporting on Migration from Obama to Trump, part of the Crimmigration Law & Policy Event Series, brings five of the nation’s leading immigration reporters to the University of Denver to share the challenges and possibilities that come with covering this politically controversial, all-important topic. At noon, Cristian Farías, an editorial writer for the New York Times, will moderate a panel of print, digital, and broadcast journalists: Pilar Marrero, independent journalist, author of Killing the American Dream, and former Senior Political Writer for La Opinión; Hamed Aleaziz, World Correspondent for BuzzFeed News; and Monica Campbell, Senior Editor at Public Radio International’s The World. Later that day, Dara Lind, Senior Reporter at Vox Media, will deliver a keynote address beginning at 5:00. Both events are free and open to the public.